Offagna, in the immediate vicinity of the B&B Montegallo (2 km), It’s located around its ancient fortress fifteenth, on top of a hill. 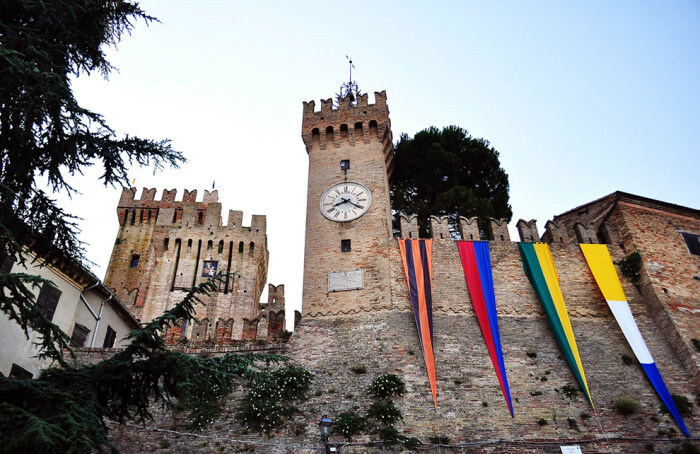 It’s among the “most beautiful villages in Italy” and in May 2013 also owns the prestigious “Orange Flag”. This magnificent village offers its tourists tradition and history, peace and rest, but also fun and frenzy. All this is summarized by the event for which Offagna is remembered by, the famous “Medieval Festival” taking place every summer in the last half of July. In the nights of July, the village comes alive and brings back to life the atmosphere of an era made of knights and ladies, war, love and magic, surrounded by the beauty of the banners, the harmony of ancient music and inspired by the arts. “Ludendo intelligo” is the motto that twenty-seven years accompanying the Medieval Festival: phrase was never more apropriate! Other sites of historical and cultural interest that are possible to admire in Offagna are: the Museum of the Fortress of Offagna, the Museum of Natural Sciences Luigi Paolucci and the Museum of the Liberation of Ancona. Do you want to relive the ancient medieval atmosphere in this beautiful village?